Awhile ago I started wondering about the gender breakdown in the VolunteerMatch network. We engage our communities in so many different places – on VolunteerMatch.org, on our blogs, on social media, in person… what is the ratio of male to female, and what can we learn from that? So I researched it. And then I made an infographic. Because how else would I present simple statistical data? There are clear discrepancies between the percentage of women who are VolunteerMatch members and the percentage of women who are VolunteerMatch staff and board. Should we be worried about that? Are we properly representing our mostly female community? What’s going on with all the do-gooder males out there? Our Product and Engineering teams should be keeping women in mind when they design our website, our applications and our tools. How is a user interface designed for women different from that designed for men? Our Communications team needs to adjust its marketing to appeal to our largest demographic – women. This means using the tools and platforms women like (cough, Pinterest…) and using language and hooks that will draw women in. Nonprofits like you who use VolunteerMatch to engage volunteers should keep women in mind when designing and describing your volunteer opportunities. What types of volunteer opportunities are “friendlier” for women? Finally: How can we get more male members? We don’t have all the answers right now, but I can promise you one thing: We’re going to be thinking about it. 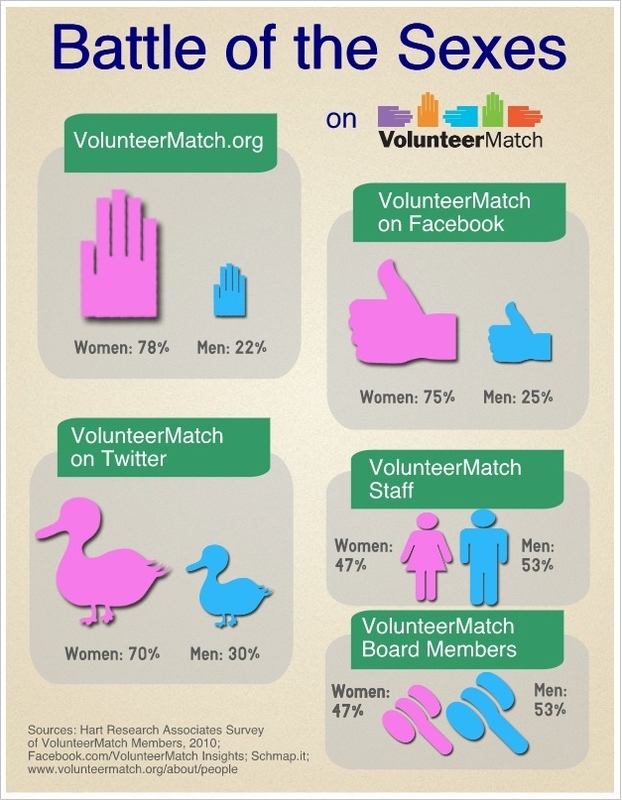 What do you think about the gender breakdown in the VolunteerMatch network? What are some ways you’d suggest to gain more male members? As a guy, I enjoy volunteering and giving back, and do it often. Admittedly, I am a single guy, and still seeking a charitable spirit as part of a quality woman to share my interests. i would love the opportunity to meet someone in these volunteer endeavors. I would suggest flagging an event a month for singles, and maybe go out to lunch as a group afterwards. Being a guy, maybe I hold a biased view, but while I think all of the recommendations are good ideas, I’d put more emphasis on bringing the male membership up to par. I did a quick search through the “About Us” section of the site and couldn’t find an actual mission statement, but I bet it’d be something like “To encourage and facilitate the pairing of engaged volunteers with valuable organizations and causes.” To that end, wouldn’t you want to be engaging as much of the population, as a whole, as possible? While tweaking the user interface and marketing approaches could make the site more female-friendly, is that really what’s needed? If the site really were lacking in it’s usability for women, I doubt there’d be a 75/25 split in its users. Time to get those 50% of male staff and board members to start throwing out some ideas to get their brothers on board!